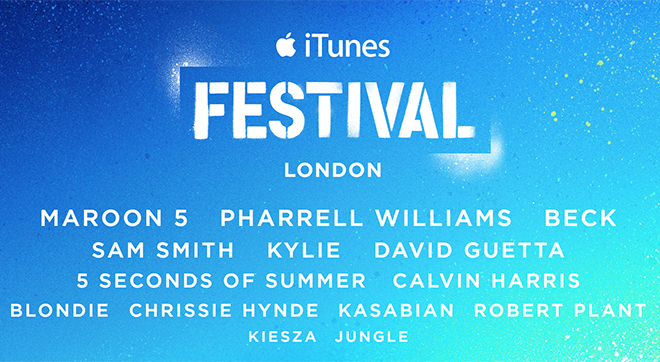 Apple on Monday revealed the initial lineup for its eighth annual iTunes Festival in London, which is scheduled to kick off in September with big-name performers Maroon 5, Pharrell and Calvin Harris joining legends Blondie, Robert Plant and more at the historic Roundhouse theater. So far, Apple has announced 14 headliners slated to perform at the event, including Maroon 5, Pharrell Williams, Beck, Sam Smith, Blondie, Kylie Minogue, David Guetta, 5 Seconds of Summer, Calvin Harris, Chrissie Hynde, Kasabian, Robert Plant, Kiesza and Jungle. In all, over 60 acts will perform throughout the festival's 30-day run in September. "The iTunes Festival in London is back with another stunning line-up of world class performers and tremendous new acts," said Apple SVP of Internet Software and Services Eddy Cue. "These live shows capture the heart and soul of iTunes and we love bringing them to our customers in the Roundhouse, as well as to the millions of people watching all over the world for free." As usual, tickets cannot be purchased and will instead be handed out at random to contest winners. In the past, Apple has partnered with local media outlets in Australia, Brazil, Canada, Europe, Japan, Mexico and the U.S. to dole out passes, while fans in the UK were able to enter drawings through the iTunes Festival app, iTunes Store and local radio stations. Apple is again streaming the event to iOS devices through the official app (likely to be refreshed for 2014), desktop versions of iTunes and Apple TV, the latter featuring an HD feed. The company has been live-streaming the iTunes Festival and select music events since 2012. In March, Apple brought the festival to America for the first time during the week-long SXSW conference in Austin, Texas. For the U.S. version, fans with Apple TVs were able to watch live performances on by tuning in to Sony's Vevo channel. For the latest lineup updates and concert scheduling, Apple has reactivated the @itunesfestival Twitter account and corresponding Facebook page.